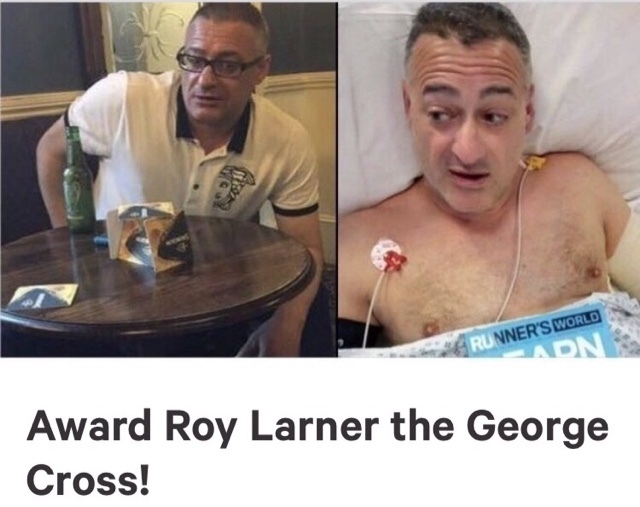 A family friend of mine and well known local Roy Larner of South London, attacked the 3 terrorists during the London Bridge attack in order to try and stop them and help others escape. He ended up getting himself stabbed and slashed 8 times on he's head, neck, torso and fingers, but managed to draw the attackers away saving countless lives. He eventually guided the terrorists into the Armed Polices sights and getting them shot down. All this whilst now famously shouting "F**** You, Im Millwall", showing great courage and preparing he's body for the ultimate self sacrifice to help others, he should be acknowledged and rewarded for he's actions! Please click link below and sign. Get family members and friends to sign as well.